Lucena Lau Valle is writing her dissertation about ethnic museums in Los Angeles’ greater eastside. 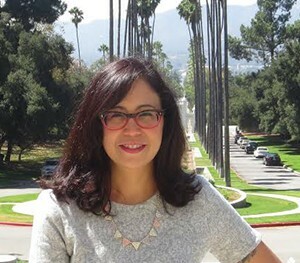 She is studying the ways in which institutions such as the Chinese American Museum, the Japanese American Museum, and La Plaza de Cultura y Artes share histories shaped by decades of real estate development. As a HOT Teaching Fellow, she will supervise undergraduate tutors at the Bowers Kidseum Afterschool Program, which hosts neighborhood kids in a lively and stimulating arts and culture setting. Humanities Out There, founded in 1997, is an eductional partnership between UCI’s School of Humanities and local schools. It aims to provide meaningful service-learning experiences for undergraduates and public humanities opportunities for graduate students through thoughtful collaborations with local institutions. Lucena brings a rich record of teaching, community engagement, and musuem work to Humanities Out There. In the summer of 2014, she served as a Smithsonian Latino Museum Studies Fellow at the Latino Center in Washington, DC. She has also worked at the J. Paul Getty Museum developing family programs and school tours for K-12 students. She has also helped develop educational content, and public programing for the forthcoming exhibition,Vietnamese Focus: Generations of Stories,organized in conjunction with UC Irvine’s Vietnamese Oral History Project, and the Orange County and Southeast Asian Center. Lucena would ultimately like to work in teaching and museum administration.